Pressure is building in the West for new international sanctions against Iran, following its announcement that it will step up uranium enrichment. After talks in Paris, French President Nicolas Sarkozy and the US Defence Secretary, Robert Gates, said the time had come for "strong" measures. The British government described Iran's new position as deeply worrying. Earlier, Iran's nuclear chief said it had told the UN's nuclear watchdog it would begin enriching uranium to 20%. Ali Akbar Salehi also said it would build 10 new enrichment plants next year, despite the fact that it still had problems with its first one. The US and its Western allies fear Iran is attempting to develop a nuclear weapon, which could require uranium enriched to at least 90%. Iran insists its nuclear programme is entirely peaceful. Iran is stepping up the pace of its nuclear confrontation with the West. If the aim is to have all 10 new enrichment plants running in a year, then it is almost laughably ambitious - it has taken many years to get the first plant at Natanz running and it still has problems. But this flurry of announcements reflects the turmoil faced by President Ahmadinejad's government, as they square up for a major day of pro- and anti-government demonstrations on the anniversary of the revolution. At their meeting on Monday, President Sarkozy and Mr Gates "agreed that the time has come for the adoption of strong sanctions, in the hope that dialogue will be resumed", an official at the Elysee Palace told reporters. They both felt the "hand held out to [Iran] has not been grasped", he said. The UN Security Council has already imposed three rounds of sanctions against Iran in an effort to make it cease all uranium enrichment activities and heavy-water projects, which could produce weapons-grade plutonium. 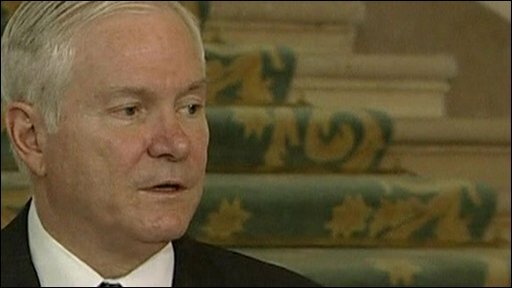 Speaking after earlier talks with the French Defence Minister, Herve Morin, Mr Gates said he still wanted to "try and find a peaceful way to resolve this issue". "The only path that is left to us at this point, it seems to me, is that pressure track, but it will require all of the international community to work together," he added. "We have to face the reality that if Iran continues and develops nuclear weapons, it almost certainly will provoke nuclear proliferation in the Middle East. This is a huge danger." Mr Morin said: "It will unfortunately be necessary to launch a dialogue with the international community that will lead to new sanctions if Iran does not stop its programmes." French Foreign Minister Bernard Kouchner was even more forceful in his comments, saying: "This is real blackmail. The only thing that we can do, alas, is apply sanctions given that negotiations are not possible." For its part, the UK urged Iran to address the legitimate concerns about its nuclear programme and to "start restoring trust in its intentions". In Russia, a parliamentary spokesman said the international community should act swiftly to send a signal of intent, and called on Iran to abide by its earlier agreements to send its uranium abroad for enrichment. A deal was thought to have been struck in October between Iran, the International Atomic Energy Agency (IAEA) and the so-called P5+1 - the US, Russia, China, UK, France plus Germany. It envisaged Iran sending about 70% of its low-enriched uranium to Russia and France, where it would be processed into fuel for a research reactor. Last month, diplomats said Iran had told the IAEA that it did not accept the terms of the deal, although there have since been other, conflicting messages. Speaking on Sunday evening, Mr Salehi said that enriched uranium production would be halted if Iran received fuel enriched to 20% from abroad. But on Monday he said: "Iran's official letter about commencing the 20% enrichment activity in order to provide fuel for the Tehran reactor has been handed over to the IAEA." Iran currently enriches uranium to a level of 3.5% but requires 20% enriched uranium for its Tehran research reactor, which is meant to produce medical isotopes. A bomb would require uranium enriched to at least 90%. Enriching to 20% would take about one year, using the 2,000 centrifuges at the underground Natanz facility, experts say. But moving from 20% to 90% would take only six months and only require between 500 and 1,000 centrifuges. Mr Salehi said that 10 new uranium enrichment plants would be built. However, experts poured scorn on that announcement, pointing to the cost of such an undertaking and Iran's problems obtaining components because of UN sanctions. Mark Fitzpatrick, a proliferation expert at London's International Institute for Strategic Studies, described the proposal as a "farcical bluff". "Iran presumably could start construction by pushing dirt around for 10 new facilities, but there is no way it could begin to construct and equip that many more plants," he told Reuters news agency. 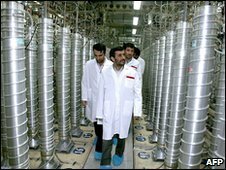 The UK Foreign Office also noted that the 20% "enriched uranium could not be used for the Tehran Research Reactor as Iran does not have the technology to manufacture it into fuel rods". The latest developments come days before Iran celebrates the 31st anniversary of the Islamic Revolution on Thursday. The event is expected to see pro- and anti-government demonstrations. Witnesses say the situation in Tehran is increasingly tense, with a series of checkpoints already set up across the city.